Bodega was set up differently last night. There were couches and seats in front of the stage where everyone would usually stand. This suited perfectly for local opening act Ben Maurice, under the guise of Paint the Sand. His music is designed for chilling back to, comprising of surf-inspired originals and laid-back pop cover medleys. Switching from acoustic to electric guitar in the past year has worked for him, making his set more varied and dynamic. He has added some nice brooding interludes to his set with the use of some distortion and a touch of reverb. He kept the crowd entertained between songs with his self-deprecating humour, checking to see if we were still awake. It was clear that Shaun Kirk had chops from the opening notes. The sound was so crisp, and Kirk commanded full control over his guitar. And it wasn’t just his guitar, either. He really was a one-man band, playing guitar, singing, blowing into his harp and playing drums though the use of pedals at his feet. It was a funny sight at times. Kirk perched on his stool strumming the gat and singing whilst lightly stomping on his many pedals. It looked like a leprechaun dancing a jig, hopping from foot to foot. I’m still not sure how he managed to keep balance atop his stool. Highlight of the night was the song “Chicken and Corn”. Kirk introduced the song with a story about his past. When he decided to become a full-time musician he’d bought himself a Kombi. He’d named it Tracy and painted it orange. He would drive from town to town playing shows to earn money to pay for petrol so he could drive to the next show. To sustain his meager existence he’d sleep in the back of the Kombi and live off a diet of only peanut butter, bread and tinned chicken and corn. It was tough at the time, but he laughs when he looks back at those times now. Kirk was a wonder to watch. We were sat down on the floor in front of him, entranced with his innate guitar playing ability and raspy falsetto voice. He channeled the spirit of the greats, like his idol, Tony Joe White, and brought some authentic Blues to lil’ ol’ Wellington. If anyone in the South Island is reading this, I highly recommend going along to the last few shows of the tour. And while you’re at it, take some cans of chicken and corn to donate to a poor blues guitarist. 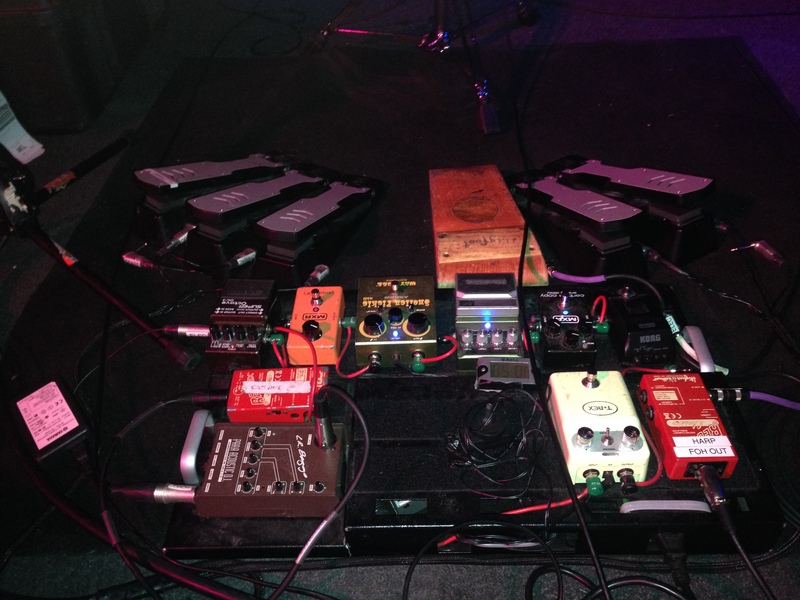 Shaun Kirk’s pedals. Note the five pedals for drums, as well as a stomp box.